Dubrova Zubnyj, Zemplyn Mychal Bon'ko - men's vocal director Helene Barnjak - women's vocal director Andrij Balint - director. 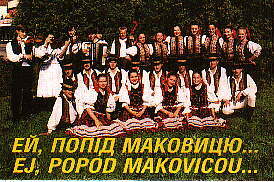 Founded in January 1991, performs annually at the Festival of Rusyn Folklore in Kamjunka; Festival of Rusyn Culture in Svidnyk and in various regional festivals including Poland, Croatia, Ukraine and in 1995 at the International Folklore Festival "Luzica '95" in Germany. Poracan Porac, Spis Helena Macala - director The ensemble began in 1974 as a women's singing ensemble with Anna Steiner as president and Mychal Djursa as director. 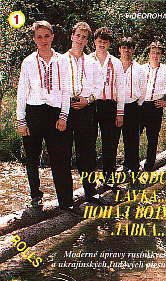 They perform authentic Rusyn folk songs from Porac and the surrounding area. Today it is a men and women's ensemble. 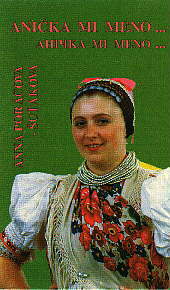 Anna Sutjakova - Poracova Native of Kyjov, Sarys. 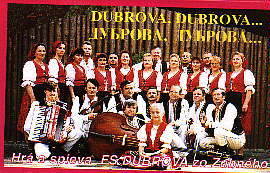 Okres Stara L'ubovna, resides in Presov and has performed with Presov ensembles "Karpatjanyn" "Sarisan". Was a laureate of the Makovic'ka Struna" Festival of Rusyn Song in Bardejov.